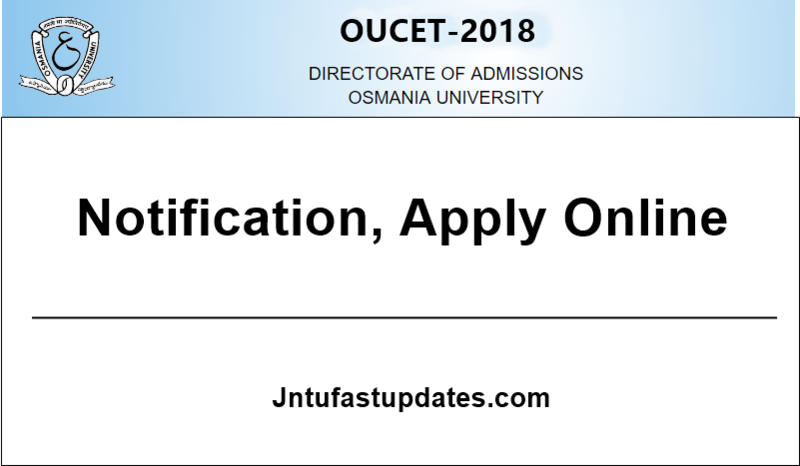 OUCET 2019 Online Application Form, Notification, Exam Dates: Osmania University Common Entrance Tests 2019 Notification has to be released, the eligible candidates can apply Online at oucet.ouadmissions.com. Online Applications are invited from the candidates who have passed or appearing for the final year examination in the qualifying degree for entrance tests and admission into various P.G. Courses, P.G. Diploma Courses and 5 yr. Integrated Programmes offered by Osmania, Telangana, Mahatma Gandhi and Palamuru Universities in their campus, constituent and affiliated colleges for the academic year 2019 – 2020. Notification of OUCET-2019: Osmania University Common Entrance Tests (OUCET) are being conducted by Osmania University for admissions into various PG, PG Diploma and 5-Year Integrated Programmes offered by Osmania, Telangana, Mahatma Gandhi and Palamuru Universities. The Directorate of Admissions, Osmania University has been successfully carrying out the gigantic task of conducting entrance tests and admissions into various courses offered by the University and its affiliating institutions since 2000-2001 academic year. The Registration and Submission of online application involves following four steps: 1) Registration and Fee Payment, 2) Uploading of colored Photo, Signature and Certificates (if applicable), 3) Filling up of application and 4) Submission. Registration Fee for a single subject is Rs.700/- for OC/BC candidates and Rs.575/- for SC/ST/PH candidates. For each additional subject, the fee is Rs.450/- for all categories. The fee may be paid at any TS/AP online centers or through payment gateway (Credit / Debit Cards / Net Banking). For submission of online application, visit the above websites. For further details, go through the Information Brochure available in the websites, www.ouadmissions.com or www.osmania.ac.in. Sir,when we are going to get PG entrance exam admit card. hi , i want to study MCA from PGRR college(OU) can u tell me when will be the entrance exam ?